Now, after the jump, this weekend’s subway advisories, straight from the MTA. If anything looks wrong, take it up with them. From 11:30 p.m. Friday, September 11 to 5:00 a.m. Monday, September 14, 1 trains are suspended in both directions between 14 St and South Ferry. 23 trains run local in both directions between 34 St-Penn Station and Chambers St. Free shuttle buses provide alternate service between Chambers St and South Ferry. From 11:30 p.m. Friday, September 11 to 5:00 a.m. Monday, September 14, 2 trains are suspended in both directions between E 180 St and 149 St-Grand Concourse. Express shuttle buses run between E 180 St and 149 St-Grand Concourse, stopping at the Hunts Point Av 6 station and 3 Av-149 St.
Local shuttle buses make all stops between E 180 St and 149 St-Grand Concourse. Transfer between trains and free shuttle buses at E 180 St, Hunts Point Av, and/or 149 St-Grand Concourse. From 6:30 a.m. to 11:30 p.m. Saturday, September 12 and Sunday, September 13, 3 trains are suspended in both directions between Crown Hts-Utica Av and New Lots Av. Free shuttle buses operate all weekend making all station stops. From 11:30 p.m. Friday, September 11 to 7:30 a.m. Sunday, September 13, and from 11:30 p.m. Sunday, September 13 to 5:00 a.m. Monday, September 14, 4 trains are suspended in both directions between Crown Hts-Utica Av and New Lots Av. Free shuttle buses operate all weekend making all station stops. Express shuttle buses run between E 180 St and 3 Av-149 St, stopping at the Hunts Point Av 6 station. Local shuttle buses make all station stops between E 180 St and 3 Av-149 St.
From 11:45 p.m. Friday, September 11 to 5:00 a.m. Monday, September 14, A trains are rerouted via the F line in both directions between W 4 St-Wash Sq and Jay St-MetroTech. From 11:45 p.m. Friday, September 11 to 6:30 a.m. Sunday, September 13, and from 11:45 p.m. Sunday, September 13 to 5:00 a.m. Monday, September 14, Downtown A trains run express from 125 St to 59 St-Columbus Circle. From 11:45 p.m. Friday, September 11 to 5:00 a.m. Monday, September 14, Queens-bound A trains skip 104 St.
From 6:30 a.m. to 11:00 p.m. Saturday, September 12 and Sunday, September 13, C trains are rerouted via the F line in both directions between W 4 St-Wash Sq and Jay St-MetroTech. From 6:30 a.m. to 11:00 p.m. Saturday, September 12 to Monday, September 13, Downtown C trains run express from 125 St to 59 St-Columbus Circle. From 6:45 a.m. to 7:00 p.m. Saturday, September 12 and Sunday, September 13, Norwood-205 St bound D trains are rerouted via the N line from Coney Island-Stillwell Av to 36 St.
From 11:45 p.m. Friday, September 11 to 6:30 a.m. Sunday, September 13, and from 11:45 p.m. Sunday, September 13 to 5:00 a.m. Monday, September 14, Norwood-205 St bound D trains run express from Canal St to Atlantic Av-Barclays Ctr. From 11:45 p.m. Friday, September 11 to 5:00 a.m. Monday, September 14, Jamaica Center-Parsons/Archer bound E trains run express from Canal St to 34 St-Penn Station. From 11:30 p.m. Friday, September 11 to 5:00 a.m. Monday, September 14, F trains are suspended in both directions between Coney Island-Stillwell Av and Kings Hwy. From 11:45 p.m. Friday, September 11 to 6:30 a.m. Sunday, September 13, and from 11:45 p.m. Sunday, September 13 to 5:00 a.m. Monday, September 14, Astoria-Ditmars Blvd bound N trains run express from 59 St to Atlantic Av-Barclays Ctr. From 11:45 p.m. Friday, September 11 to 5:00 a.m. Monday, September 14, Astoria-bound N trains skip 49 St.
From 11:45 p.m. Friday, September 11 to 6:30 a.m. Sunday, September 13, and from 11:45 p.m. Sunday, September 13 to 5:00 a.m. Monday, September 14, Manhattan-bound Q trains skip 49 St.
From 11:45 p.m. Friday, September 11 to 6:30 a.m. Sunday, September 13, and from 11:45 p.m. Sunday, September 13 to 5:00 a.m. Monday, September 14, R trains are suspended in both directions between 59 St and 36 St in Brooklyn. From 6:30 a.m. to 11:30 p.m. Saturday, September 12 and Sunday, September 13, Forest Hills-71 Av bound R trains run express from 59 St to Atlantic Av-Barclays Ctr. From 6:30 a.m. to 11:30 p.m. Saturday, September 12 and Sunday, September 13, Uptown R trains skip 49 St.
From 11:30 p.m. Friday, September 11 to 5:00 a.m. Monday, September 14, the Rockaway Park Shuttle is suspended. Free shuttle buses provide alternate service between Rockaway Park and Beach 67 St A station, stopping at Beach 105 St, Beach 98 St, and Beach 90 St. Transfer between free shuttle buses and A trains at Beach 67 St. Unfortunately, Transit Wireless was unable to complete service installation for day 1. What the hell have they been doing all this time? The rest of the world is laughing at us. We couldn’t figure out platform screen doors, we spent months on an inclined elevator, and now we haven’t even installed cell service in the newest station in the system. The General Contractor wouldn’t give them a time slot (“coordination”) to enter the construction site without an envelope of $100 bills. They could’ve delayed the opening of the station further in order to get WiFi installed – but would that have made any sense? Is there really that much of a difference between 8 years even and 7 years, 11 months from contract award to the first train into the station? This thing should’ve been and would’ve been open 6 years ago if it wasn’t being built here. What’s another month? You might as well admit failure and announce another delay. People can use subway stations that don’t have wifi service. People can also use subway stations without escalators, so I guess we shouldn’t have bothered with those, either. The escalators are working. Wifi isn’t an ADA requirement. Funky elevators are. 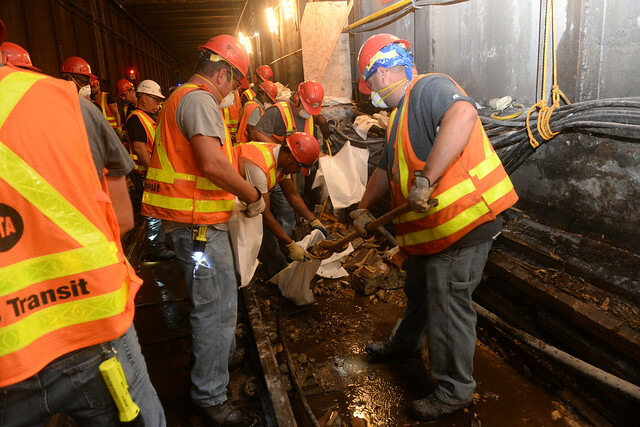 The truth is that the 7 extension is a useful microcosm of all the problems plaguing the MTA. You want to know why the rest of Second Avenue won’t happen, why the new Northeast Corridor tunnels won’t happen until the existing ones fail in a sufficiently spectacular way, why nobody will be taking the LIRR into Grand Central at any point over the next 64 years? It’s because, rather than delays being “a few months,” the schedule slips start at a year and can span entire generations, on projects whose initial timescales are ALREADY measured in unacceptably long spans. That has a knock-on effect on everything else. The truth is that most places – even here, in fact, for major public works projects that carry anything other than transit – can propose a project with comparable scale to the 7 extension and have it done – complete from start to finish – in the amount of time that this extension has merely been delayed by, never mind that the contract was awarded 8 years ago next month. That’s for 1.5 stations and 7,000 feet of tunnel. How quickly do you think money would become available for things like the rest of Second Avenue if funding it tomorrow morning meant that everyone living on the East Side could start taking T trains in time for the next mayoral election? The high cost of new transit suddenly stops seeming like much of a problem when paying that money means that the beneficiaries put up with months of disruption instead of decades and the exact same leadership group that inked the contract gets to attend the ribbon cutting. And, of course, it’s not just Second Avenue. Everywhere else – crosstowns in the Bronx and Upper Manhattan, the transit deserts of Northern Queens and Southern Brooklyn and Staten Island – all of the desire lines that can be drawn up and down the map would experience a newfound wave of political and public support. Why? Because everything would go from ink on paper to shovels in the ground to people riding brand-new trains in a reasonable amount of time. No longer would supporting a subway extension down into your neighborhood mean decades of disruption likely for someone else’s benefit in the distant future, instead it would mean that you stand a pretty good chance of actually directly benefiting as a result of the project you had to put up with. That can only happen, however, if we address the absurd and unacceptable lengths of time that it takes for things to get done when it comes to transit. are all the 7 trains going all the way to hudson yards? or do half of them still end at times square? i’ll try to ride on it sunday afternoon as well. All go to 34th. It’s the new terminal, not part time. At the end of the post, before the weekend service changes, you describe events for the 7, not the G.
Well given the title of the post mentions the G, the 7 and the weekend I would expect it to include items about the G, the 7 and the weekend! I am glad to see that station finally open, but it’s really a disgrace how the 10th Ave./41st St. station was not built. Consider all the money that gets wasted in this town on boondoggle projects (such as the Calatrava station and the Fulton Center), it would have made a lot more sense to build that station. Speaking of the Fulton Center, I was down there last week. It seems to be empty of stores. The upper level is still closed off, because there is nothing up there to go to. Former Bloomberg aide Dan Doctoroff co-authors a piece in the Daily News today with Michael Meola pushing for funding for the 10th Avenue station (they say at 42nd Street instead of 41st, but that’s simply because 42nd has more cachet to justify a station in the minds of the public). It may never come to anything, but it is helpful that at least a couple of people familiar with the world of NYC politics and real estate are still pushing for the 10th/41st station, and it hasn’t simply been relegated to the pleadings of railfans on message boards. OK, thanks for the link! $2.4 Billion for one station and 1.5 miles of new route. 8 years to construct (but it has escalators). At that rate, the entire 233 miles of the subway system would take over a thousand years to build. No wonder the posts about never seeing the T in service. We’ll all be long dead and buried before it’s done, even assuming construction were to actually begin on Phases III and IV. New York really sets new records for not getting transportation projects done. You forgot to say that most of New York City would be underwater when we’re all gone. Lower Manhattan will mostly likely be wiped from the map. P.S. — Buiding a station on 23rd street right on landwill is not a good idea. Not that it was going to happen anyway, I mean do people remember rising sea levels and Hurricane Sandy?? Just got back from checking out the new 7 train station. It was cool to see so many excited people mulling about and taking pictures of everything. It also felt really good to ride on a segment of track that’s new and thus subject to fewer bumps and jolts. (1) why is it so far underground? Is it due to geology or the need to get below the Hudson Yarda trains and other utilities? The escalators are so long that I almost felt like I’m in Moscow. (2) what’s up with the super-big but unprogrammed mezzanine right above track level? Is there any plan to do something with this space? (3) why does the park south of 34th (where the main entrance to the station is) span all the way to 33rd but isn’t accessible from 33rd? It’s pretty awkward that there’s a chain-link fence and then a 10′ drop to the street. Are there plans to add a stairs or ramp? Or maybe the street level will be raised by 10′ once the construction south of 33rd is complete? (4) is that an unfinished station entrance I see in the park north of 34th? With all the extra time they’ve had, how is that still not complete same? Same sentiments for the lack of cellular service on the platform. Can’t answer 2 or 3, but the answer to 1 is indeed that the station needed to be that deep in order to get under everything else there and the answer to 4 is that yes, it’s another entrance, theoretically opening in December. I say theoretically because it’s anyone’s guess as to when it’ll actually open in the land of make-believe schedules. I couldn’t quite figure out where the second entrance connects with the station. I didn’t find anything loosely walled off anywhere. The closest I saw to something that might be “temporary”, is a section of boring painted cinderblocks in the northeast corner of the lower mezzanine. (2) Presumably the full mezzanine is so people can exit the platform near where they exit the train rather than having to walk along it, which could be dangerous in the event of crowding. Specifically on No. 1, the decision was made to drill the bore under the three tubes for the Lincoln Tunnel, which mandated a deep station of 34th Street. The MTA might have been able to do a shallow bore over the tubes at 11th between 41st and 37tth streets, but that likely would have required cut-and-cover, which has been persona non grata with the MTA since the fight in the early 70s over the 63rd Street connection going through Central Park (the deep bore does serve the purpose of making a future connection to Secaucus theoretically viable, even if nothing’s ever built, since the tunnels are deep enough already to go under the Hudson). To build this new stop, they had to go under the 8th Ave. line, under the PABT underpinnings, under the Lincoln Tunnel and under Amtrak’s Hudson River tunnels. There was no physical way to do anything other than deep bore here unfortunately.